Anne Koehlinger is an exceptional student at a chicago metro area culinary college with a remarkable talent: ballroom dancing. Her love of dance grew from attending the prestigious Arthur Murray Dance School, where she rigorously trained for the Chicago Medal Ball and the Chicago Showcase Ball Competition in late 2012. While studying at Arthur Murray Dance School, Anne Koehlinger learned complex dance techniques that sharpened her skills and kept her fit during competitions. The development of her extraordinary dance abilities and competitive edge, however, did not occur overnight. Anne Koehlinger praises Arthur Murray Dance School’s instructors for their impeccable training skills and constant drive to teach students a wide-range of dance techniques. She encourages all aspiring ballroom dancers to enroll in classes at this world-renowned academy. Arthur Murray Dance School is an international studio with over 260 dance centers in 21 different countries. Each dance center is independently operated and owned by highly acclaimed dance professionals who strive to educate individuals about the benefits of dance. The instructors at Arthur Murray Dance School provide a comfortable and social learning environment for students ranging from 18 to 80 years old. Students who trained consistently under Arthur Murray’s teaching methods reported enhanced strength, improvement in posture, increased self-confidence, weight loss, lowered blood pressure, and a more positive attitude. Beginners seeking immediate results can enroll in private dance lessons to gain helpful tips while working one-on-one with an instructor. Group sessions are also provided. Within every category of dance, students are welcome to pursue an array of programs ranging from beginner to intermediate level courses. Anne Koehlinger has had the opportunity to strengthen her dance skills through Arthur Murray Dance School’s targeted programs. She continues training and learning advanced ballroom dancing techniques to this day. 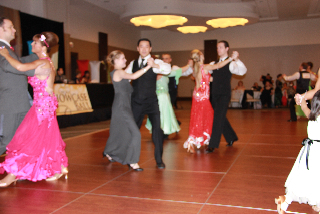 Learn more about Anne Koehlinger and her Ballroom Dancing experience by visiting her profile on Bigsight or view her Weebly: http://annekoehlinger.weebly.com/.